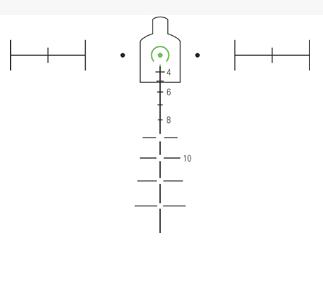 This is the Trijicon TA11H-308G reticle, set up for the standard 147-150 grain 7.62×51 round, plus or minus based on barrel length and so forth. Pretty close though. Learning YOUR mil dot scope and making a “dope” card for your rifle and scope combination is mandatory. ranging mildot or ballistic reticle (w/other ranging method)?